PolyLevel® polyurethane injection repair saves time and money while reducing hazards and accidents. 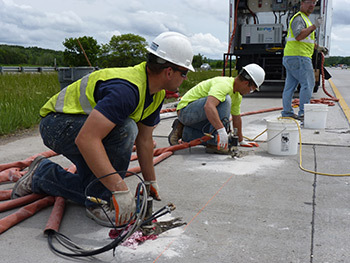 Our cutting edge techniques can be used for a wide variety of municipal repairs, including roadways, parking lots, runways, rail beds, sidewalks, and more. PolyLevel® has the capability to tackle big concrete lifting and leveling jobs quickly and effectively. It is faster, cleaner, less disruptive, and often more affordable than conventional methods. The PolyLevel® approach involves delivering a two-part catalyst and polyurethane formulation to an injection/mixing nozzle via a heated hose. The polyurethane begins to expand after it has been injected under the concrete slab. This allows it to be used in a wide variety of weather conditions. Unlike conventional mudjacking, cleanup is minimal and does not require the use of water that would cause icing hazards in cold weather. Allow us to consult with you on the best approach to solve your settled and sunken concrete problems. Contact us for an on-site inspection and free quote! No down time needed. PolyLevel® is ideal for municipal applications because it can be installed without any disruption, such as on a busy highway or road. In the past, both residential and commercial slab settlement problems have been “corrected” with toppings, overlays, mudjacking, or by removal and replacement. All of these methods have significant disadvantages when compared to PolyLevel® methods. For highways, streets, sidewalks, parking lots, and airport pavements, PolyLevel® is attractive to municipal public works managers because of its lower initial cost, reduced disruption to traffic, and ability to restore roadway serviceability quickly and permanently. For example, PolyLevel® injection resins can be used to consolidate the sub-base and re-level pavement slabs in roads that have become uneven. Even large sunken areas can be lifted with minimal impact on traffic. Bridge approach and departure slabs can be adjusted to provide smooth transitions. By filling voids, movement along slab edges at joint lines is eliminated. Void filling under slabs will also significantly extend the useful life of the concrete and help prevent future settlement. Storm water paths can be adjusted to reinstate flow and eliminate ponding. Call us at 1-888-310-4467 or contact us online for a Free Estimate or to find a PolyLevel® contractor in your area!